It's getting warm here & I find myself needing a weekend getaway. As May approaches, I am reminded that Zach & I only have a few weeks left of being in the same state. Soon, he'll head back to Michigan as his military contract is over. He's on the job hunt & we'll be apart. He's been gone before, and it was hard. I found this awesome bag from Spotted Moth (here's another color too!) which would be a perfect weekend duffle. I love the chevron pattern, of course, and it just screams 'take me somewhere warm!' Spotted Moth is one of my fave online haunt..I have a nice small cross body bag from there. I need to pick up something else. Some remixable outfits. A nice comfy (i.e. fit) pair of shorts & a few comfy shirts. Ideally, you shouldn't spill any froyo or other delicious food on your pants as you'll wear these both days you're sight seeing. A flirty dress for a nice evening out. A walk a long a board walk or under street lights after a yummy meal at a cool local restaurant. The good thing about traveling in the Spring/Summer is that things are easier to pack because they are lighter! Fun shoes for a night out for a nice dinner & that walk under the streetlights. Comfy flats you'll be able to walk around in, maybe even some sneakers but how is that chic? Comfy worn in sandals always do the trick for me. And of course flip flops for the beach excursion I'd love to go on. Spending a day soaking up sun with the one you love just sounds like paradise, doesn't it? Some fancy accessories would take up space too. The scarf (if it's big enough) can double as a wrap skirt or makeshift shirt for a beach cover up. I love a hand full of rings, flashy sunglasses & a sleek cross body bag. This yellow bag is the best! Finally for a beach bag. Rolling up a canvas bag & sticking it in your weekend bag makes it a great compact way to bring a beach bag a long with you. 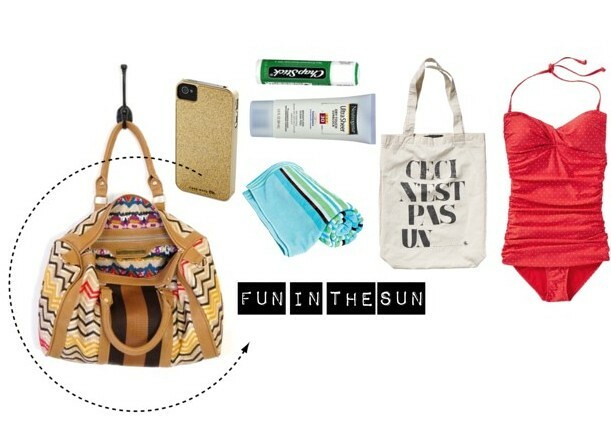 Don't forget the sunscreen & tunes. Since my iphone doubles as a camera, sometimes I feel like I don't have to bring my DSLR. I am still getting used to using my DSLR in real life so sometimes I forget it..sometimes I don't want it to get ruined so purposely leave it at home! I really hope we can catch a weekend away between his job interviews & before he heads out to Michigan! It's been hard when he's been gone & it's gonna be harder knowing that there's no set date for him to be back. 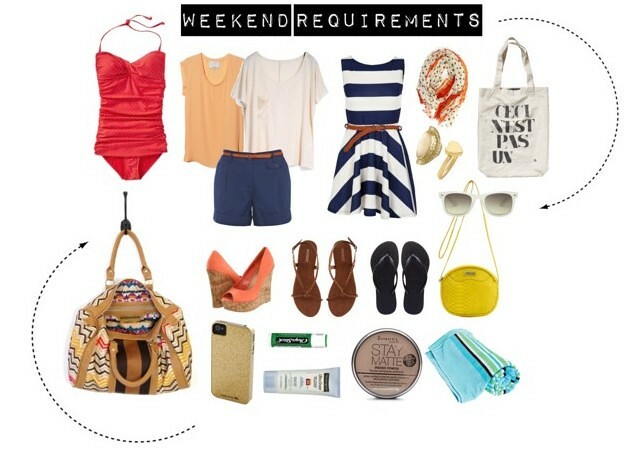 What do you pack in your weekend tote? Any fun spring plans? *drools* I love them all! I love the wedges, too. I can't do anything that isn't completely flat, but they sure are fun to look at.